Hundreds were in attendance for the grand opening of Chichester Rugby Club’s new headquarters. The event celebrated the completion of the Oaklands Pavillion, which gives the London one south club a home to be proud of and also gives the wider community a wonderful new facility. The £600,000 project took eight years from the moment the idea to expand the old clubhouse was born. The clubhouse was officially opened by England and Harlequins player and former Chi RFC youngster Jess Breach, one of a number of former Chi RFC youngsters who has gone on to gain international honours. 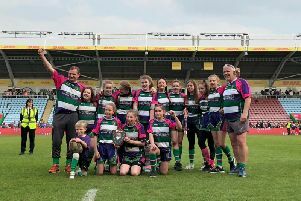 The purpose of the project has been to make Chichester a club for the whole community and chairman of Chichester RFC, Paddy McAlpine, said: “The project represents the largest piece of community action in the City’s history with total funds raised in excess of £600k. McAlpine spoke of the importance of the pavilion to club and community. “This is the place where lifelong friendships are made and rugby journeys begin,” he said. “For some, that journey starts in the mini and juniors and runs through the age groups into the seniors, and then the first XV. For others, it’s the start of a lifetime of volunteer support engagement within the club, as a player, a parent, a coach, a physio, a manager, and on a really bad day, all of those at the same time. “And then on to the committee, or as a player to a supporter, to builder, painter, joiner, plumber and electrician, to help maintain our clubhouse. David Kay, the club commercial manager who as minis chairman was instrumental in the project getting started, said: “In 2010, we drew the original thoughts and our original ideas of what we were trying to achieve. “The objectives of the project was to try to build a legacy for future generations of rugby. We have grown the mini and junior group, and we couldn’t fit everyone in on Sundays, so we needed to start to lay the foundations for the future. “We couldn’t get disabled individuals up on to the upper floor, so we wanted to sort that out. We also wanted to make the clubhouse more attractive in what is a beautiful park. Critical stages of the work came when trees covering the rear of the site were felled in June 2014. The old gym was demolished and building work started in November 2014 with the roof completed in April 2015. The first President’s Lunch was held in the extended hall that month. Aside from financial contributions, hundreds of hours of volunteer time have been and continue to be given cleaning, demolishing, bush clearing, painting and carrying.